Sauted Prawns or shrimps marinated in ginger and green chillies. 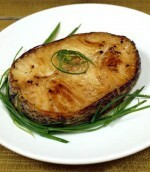 Fish marinated in lemon juice and baked with spices is high in flavors and low in calories. Bbq creates a delicious and moist fish. This is an easy recipe with step by step intruction to make a tasty meal. Deepfried fish strips seasoned with soya sauce and other spices. Breaded Prawn Cutlets are not only good in taste but very nutritional and rich in Vitamins and protiens. Tasty Fish Tikka recipe, very delicious and crispy to eat and easy to cook. Fried fish coated with spices and coconut and a hint of vinegar. Fish fillets are coated with a mixture of spices and seasonings and gently simmered. Fish marinated in spices and then deep fried. These little fish balls are absolutely delicious! and make a hearty appetizer. If you love seafood you will love this breaded fish recipe.